The chic Silver Vertical Bar Necklace gives you the chance to personalize a stunning piece of jewelry to your exact liking. 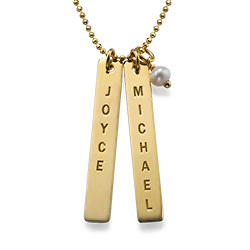 Each 925 Sterling Silver nameplate bar can be engraved with the name of someone you love, and you can choose to add from one to five bars added. The bars hang from a 925 Sterling Silver chain, and you can even include a birthstone of your choice to this necklace for a little extra sparkle. What a trendy way to display the love you have for your family! Great piece. Clean, simple, and powerful. My wife loves it.